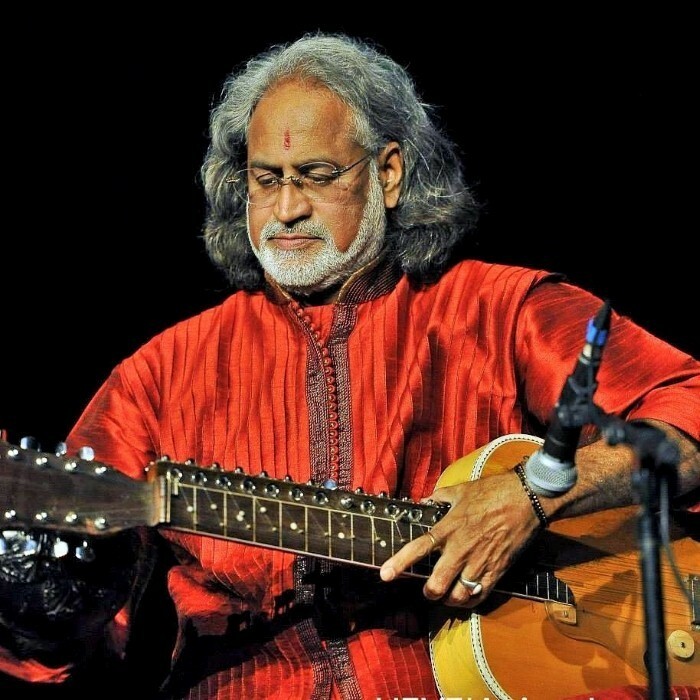 Vishwa Mohan Bhatt, also known as V. M. Bhatt (born 27 July 1950), is Grammy-winning Hindustani classical music instrumentalist who plays the Mohan Veena (slide guitar). Vishwa Mohan lives in Jaipur, Rajasthan, India, with his wife and two sons. His elder son Salil Bhatt is a Mohan veena player (and also a player of the Satvik veena). Vishwa Mohan Bhatt's parents late Manmohan Bhatt and late Chandrakala Bhatt were also teaching and performing musicians who imparted knowledge of music to V.M Bhatt. His nephew, Krishna Bhatt, plays the sitar and tabla. Bhatt is best known for his Grammy award winning album A Meeting by the River with Ry Cooder released on Water Lily Acoustics label. He is also known for other fusion and pan-cultural collaborations with Western artists such as Taj Mahal, Béla Fleck and Jerry Douglas. Exposure such as an appearance on the 2004 Crossroads Guitar Festival, organized by Eric Clapton, allows his playing to reach a larger audience. Guitar duet release with Guitarist Kapil Srivastava (guitarmonk founder) in the year 2016 for the composition Merry Love Rain. Folk musician Harry Manx, who studied with Salil Bhatt for five years, plays a Mohan Veena. Counting Crows' bassist Matt Malley also plays a Mohan Veena and is a student and friend of Vishwa Mohan Bhatt. Australian musician Lawrie Minson also learnt Mohan Veena from Salil and Vishwa Mohan Bhatt.